In contrast to vowel sounds, which are made by completely opening the vocal tract, consonant sounds are created by momentarily blocking the vocal tract while expelling air. Once again, you must learn to distinguish consonant sounds from consonant letters. Portuguese uses the same letters as English, but the corresponding sounds can be completely different. Also, letters are pronounced differently across dialects, even within the same country. Therefore, it is extremely important for you to stop thinking about speech sounds in terms of letters. If you can separate the two, you will be able to easily distinguish the differences in accents and acclimate your ear to new dialects. Your ability to think of Portuguese purely in terms of the sound will improve as you learn more songs. Once again, each of the letters used below will ALWAYS represent the sound assigned to them. This is completely independent of either the Portuguese or English writing systems. In English, we create the /d/ and /t/ sounds by touching the tip of our tongues to the point where our gums meet our teeth (alveolar ridge). In contrast, Portuguese /d̪/ and /t̪/ sounds are made by touching the blade of the tongue (just behind the tip) to this same spot. To do this, you have to stick your tongue out a bit further, causing the tip of your tongue to actually rest beneath you upper teeth (hence the name "denti-alveolar". Notice the little "tooth" symbol underneath both letters - let this remind you of this difference between the English and Portuguese sounds. Denti-alveolar d and t, Portuguese vs English by The Mimic Method on This may seem like an unimportant detail, but it is EXTREMELY important to build a habit of dentalizing your "d" and "t", because certain Portuguese sound combinations are IMPOSSIBLE to produce with the English, tip-of-the-tongue, /d/ and /t/. This sound is created by lightly flicking the tip of your tongue against the alveolar ridge. It is most similar to the English /d/ sound. In fact, many English speakers have trouble distinguishing these two sounds at first. The difference between English /d/ and /&/ is that for /d/, we build up air behind the tongue and release it, whereas for the /&/ there is no air buildup. As such, it is helpful to conceive of /&/ as a fast English /d/. If you find it difficult to create this /&/ sound, it is best to temporarily replace it with the weakest English /d/ sound you can manage. Also, recall from the last page that the Portuguese /d̪/ sound is made with the blade of the tongue (just past the tip), distinguishing it from the /&/ made with the tip of the tongue. In most North-American dialects of English (and some other English dialects) this sound does actually exist. For example, Americans will typically say the word "better" with a tap in place of the /t/: "be-&er". The audio file to the right has more examples of the alveolar tap in English. This sound has a variety of pronunciations, depending on dialect, speaker and situation. The same speaker will create this sound in different regions in the back of the mouth. To conceptualize it better, what varies is the the "deepness" of the sound in the back of the throat. As an English speaker, you should not have trouble with this sound, even though it doesn't really exist in English. You will create a similar sound when you clear your throat make the sound of "hocking-a-loogie" (though in Brazilian Portuguese it is typically not this strong/deep in the throat). A better example is the sound you make when imitating the hiss of a cat, or when impersonating the breathing of Darth Vader. Listen to the audio files to the right to get a better idea of the different varieties of this sound. Since they are heard all the same anyways, it doesn't really matter which one you do. Sometimes, this sound will be equivalent to the English /h/. In certain situations, this sound will even be completely omitted. In general, know that there is more than one way to make this sound, and the same person will say it different ways depending on the context. When listening to and MImicking Portuguese speakers, try to open your ears up to the different nuances. This sound exists in English, it's just that there is no specific letter to represent it. It's the same sound as in the English words "measure" and casual" and "garage"
If you make the "shhhhh" sound while humming (activating your voice box), you will make this sound. And that's it! As different as Portuguese sounds from English, there are very few differences in their consonants. 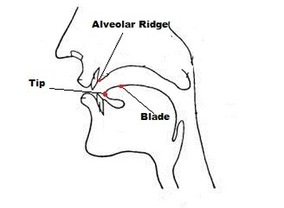 Some of you may trip up with the alveolar tap /&/, but the rest of the sounds should not be difficult. The trick is learning to create these consonants sounds in combinations that don't exist in English, and this is why we have the song training. Your biggest challenge in learning the Flow of Portuguese will lie with the nasal vowels. This is what we will look at in the next section - Nasal Vowels.